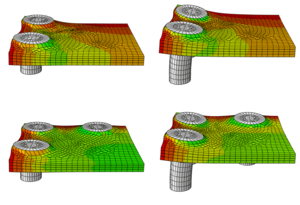 Students have to know, understand and apply the basic principles of The Finite Element Method. They have to be able to write short MATLAB scripts for numerical integration, time integration, solution of nonlinear problems and problems related to interpolation and discretization. They need to have an overview of the structure FEM packages and operational knowledge of: mlfem_nac.